Can you confirm these amateur observations of Ophisops minor? minor: E Sri Lanka; Type locality: “Bulupitiya-Nilgala area in Uva Province”, Sri Lanka. Comment Synonymy: partly after SMITH 1935. After Cabrita was synonymized with Ophisops by ARNOLD 1989, Cabrita jerdonii BEDDOME 1870 became a homonym of Ophisops jerdonii BLYTH 1853. Hence, ARNOLD 1989 proposed a substitute name, Ophisops minor nictans. Unfortunately, DERANIYAGALA 1971 had described Cabrita jerdoni minor previously, which may be conspecific with O. nictans, and thus has priority. However, the status of minor remains unclear as there appear to be very few known specimens. 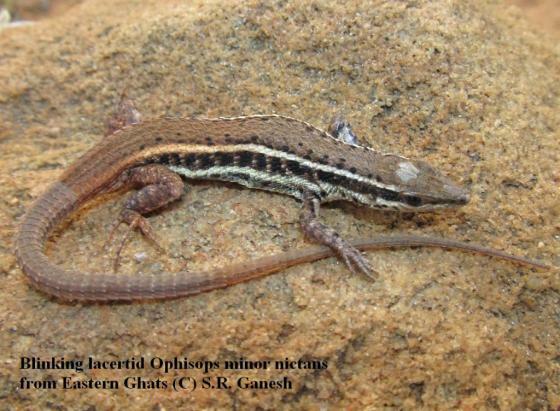 Etymology Named after its rather small body size compared to Ophisops leschenaultii. O. m. nictans has been named after the presence of eyelid and nictitating faculty in this subspecies.